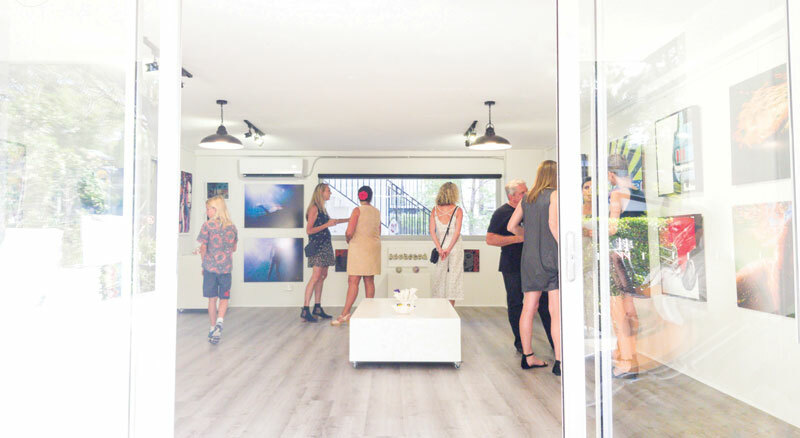 Almost a year after opening a new art space in Avalon, owner Tina Berkeley is delighted that her Be Brave gallery is making its mark as she looks forward to exciting new projects in the pipeline. The former primary school teacher told COVERED. about finding her niche in the creative world. I wanted to find a studio space where I could be creative again; to ‘Be Brave’ and start painting with the enthusiasm and drive I used to have before becoming busy raising my four boys. As it turned out, I found a space that had two floors which allowed for a gallery on entry level with the possibility to extend exhibitions into the studio space downstairs. I have been hosting solo exhibitions all year. Showcasing talented local and regional artists. We have an opening at the start of each exhibition. The openings are on a Friday night from 5.00pm to 8.00pm where everyone is welcome to come and have a drink, some nibbles and be inspired by new artworks and fresh artists. There are so many amazing artists on the Northern Beaches and beyond, and I hope to provide them with an opportunity to share their creative work with fellow art lovers and enthusiasts. I am always happy to discuss the possibility of representation and the availability of gallery space with new artists. This has been one of my many highlights this year, I have met some wonderful artists and made many new friends who share my love of art. At the end of each year, I will be curating a group exhibition called ‘Brave’. I’ve decided to leave the theme loose, focusing more on each artist’s signature works. I want the exhibition to demonstrate courage, creativity and commitment. The exhibition this year will be the forerunner to a change in the gallery model which will see me turning over solo exhibitions upstairs only while maintaining a permanent gallery downstairs, where I hope to represent various artists on an ongoing basis. Art taps into our emotions and you know when a work speaks to you. You just feel it, like when you hear a piece of music, it connects with something beyond intellect. So, I hope that people will come in to the gallery, look around and immerse themselves in art. Be Brave Artspace will be ever evolving, different, dynamic and always artistic.